On August 31, 1922 the Electro-Motive Engineering Corporation (EMC) was incorporated in Cleveland, Ohio. EMC designed its railcars, but assembled components from other firms and had the railcars, themselves, constructed by established passenger car builders. 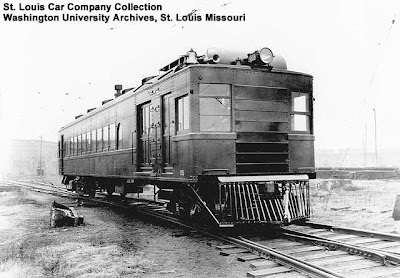 By October 1923, construction of EMC's first rail motorcar had begun in the shops of Saint Louis Car Company. On October 28, 1925 Great Northern 2313 was completed. Given the serial number 130, it was the 30th production rail motorcar. GN 2313 first entered service on November 27, 1925 for trains 259 and 260 between Marcus, Washington and South Nelson, British Columbia. Here is the fully illustrated story of Great Northern 2313, designated an American Society of Mechanical Engineers Historic Mechanical Engineering Landmark. Sperry 131 hit by derailment! "Is it Delivery or DiGiorno?" The Train Master - Revisited!